Create and display image processing gamma editing curves. List of float values specifying the x/y ranges for the graphy in the form of minX, maxX, minY maxY. Specify curve type, one of linear, spline or curve. User defined data which can be retrieved via the cget subcommand. The curve widget allows a user to edit a curve covering a range of values. It is typically used to fine-tune color balances in graphics applications. The curve widget has 3 modes of operation - spline, linear and free. 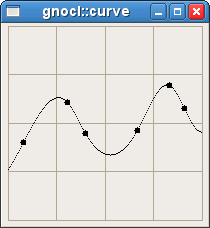 In spline mode the user places points on the curve which are automatically connected together into a smooth curve. In linear mode the user places points on the curve which are connected by straight lines. In free mode the user can draw the points of the curve freely, and they are not connected at all. Returns the value for the specified option. The option may have any of hte values accepted by configure. Returns the class of the widget, i.e. statusIcon. Returns a vector of points representing the curve. Resets the curve to a straight line from the minimum x and y values to the maximum x and y values (i.e. from the bottom-left to the top-right corners). The curve type is not changed. Recomputes the entire curve using the given gamma value. A gamma value of 1 results in a straight line. Values greater than 1 result in a curve above the straight line. Values less than 1 result in a curve below the straight line. The curve type is changed to free. Sets the vector of points on the curve. The curve type is set to free..